Due to work commitments and holidays (the latter regrettably not mine) it had been a while since J and I had met up for lunch. 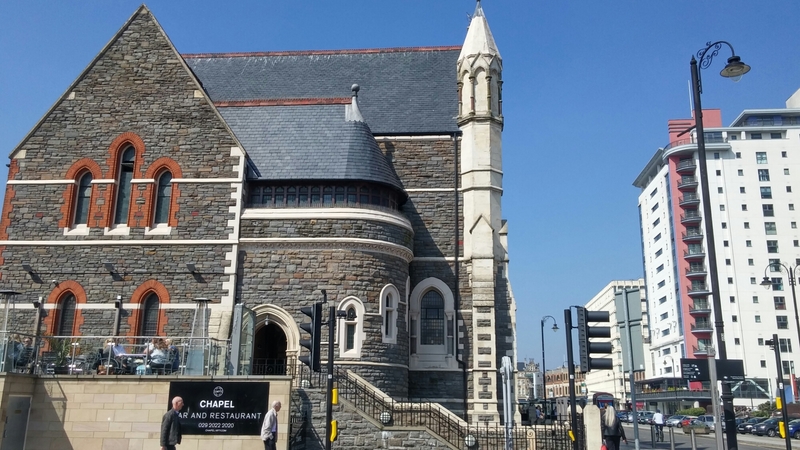 After a bit of a debate as to the venue (she rather selfishly, in my view, insists on sometimes going out to lunch without me and with not a thought as to whether I have been to the place in question), we decided on Chapel 1877 in the city centre. The real seller for me was the presence on the bar menu of a dish that sounds remarkably akin to that inspired French Canadian “chip” dish – poutine. Fries/chips to which cheese curds (sort of half way between mozzarella and halloumi) and then gravy is added (leading to a warming and softening rather than melting of the cheese curds, so they retain a certain squeakiness) has always appealed to me. 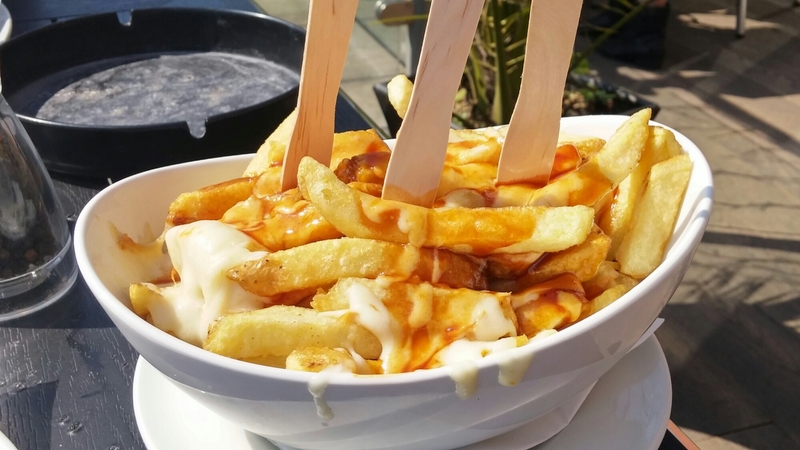 Popular all over Canada and the Northern USA, this cheese, chips and gravy combo on their menu sounded (appropriately for a restaurant in a converted chapel) just heavenly. 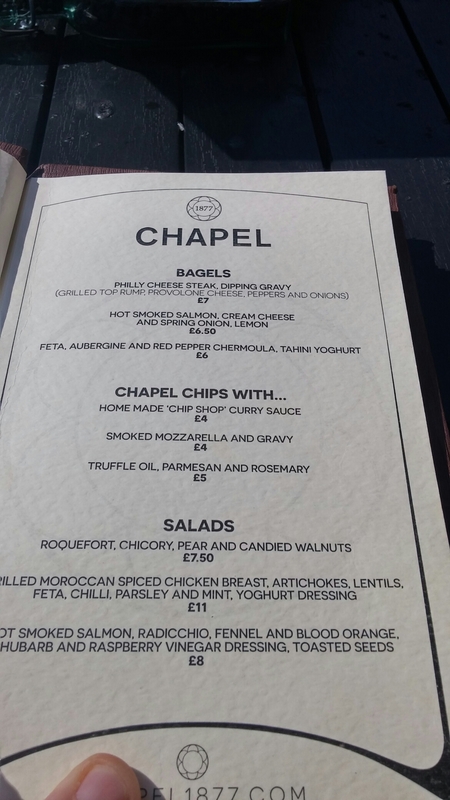 At the Chapel 1877, their take involves use of smoked mozzarella as the cheese element, which apparently makes it actually a “New Jersey” poutine or “disco fries” although that involves standard rather than smoked mozzarella. It would seem there are a myriad of variations on a theme when it comes to poutine. and stunning on the inside. My crappy picture taking skills and use of a phone camera wouldn’t have done it justice at all I am afraid (so I didn’t bother trying) and in any event it was a nice day so we sat outside on their terrace. They have on their website some nice pictures of the inside of the place, which are in my view a fair reflection of how nice it is. Even the toilets are really rather lovely. To go with my smoked mozzarella “poutine” (£4.00), I went for the Philly cheese steak bagel (£7.00). This was described on the menu as coming with dipping gravy, grilled top rump, provolone cheese, onions and peppers. I was somewhat disappointed by the Philly cheese steak I had at the Smokehaus and I have to say I suspect a resident of Philadelphia would probably have a few choice words to say about a Philly cheese steak utilising a bagel. Traditionally they are based on a Amoroso style sandwich (hoagie) roll. 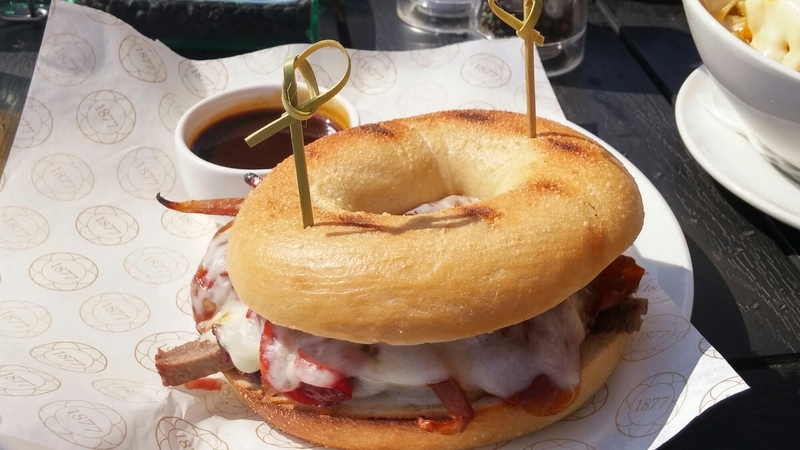 Whilst use of a bagel may well be heresy in the eyes of someone from Philly, I have seen plenty of examples of its use as part of a cheese steak on the web so to me it is no biggie. It was nice to see the cheese used was provolone. This sharp cheese is, considered by many to be the “real cheese” for a cheese steak, although Cheezwhizz is viewed as more than an acceptable alternative. 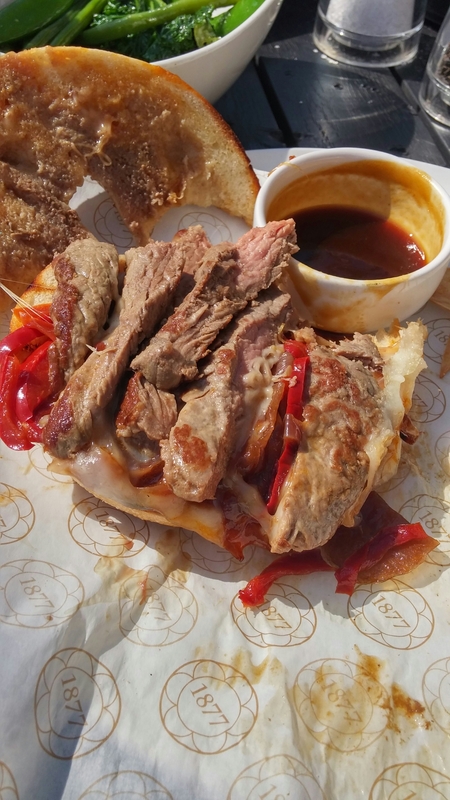 The addition of a dipping gravy (thicker here than an anjou) made it a sort of hybrid between an French Dip sandwich and a Philly cheese steak. “La Philly Dip” perhaps. This was more a steak sandwich than a cheese steak with quite thick slabs of beef rather than thinly sliced steak al a your standard cheese steak. What it was, however, was very tasty. Good quality, tender meat cooked medium rare with nice sharp cheese, grilled peppers and fried onions. Add to this, an excellent gravy and a decent bagel (that had enough structure to take the cheese steak and gravy without disintergrating) and what I had was a very satisfying lunchtime dish. The poutine was also pretty good. Decent chips smothered in the same good gravy as came with the cheese steak bagel and melted mozzarella (didn’t get any discernable smoked flavour from the later). Not a classic poutine, but none the worse for it and very moreish. I notionally admitted defeat about three times and went back for more each time, much to J’s amusement. The three forks in it were rather telling of my piggyness. Great dish to share for the purposes of soaking up a few beers of an evening. Being on another diet (no carbs), having apparently drunk her body weight in toffee vodka whilst skiing in the Alps, J went for the leg of lamb dish with colcannon, but asked for the potato element to be replaced with mixed vegetables. This requested was met with a smile and “no problem” (service was very good all round). 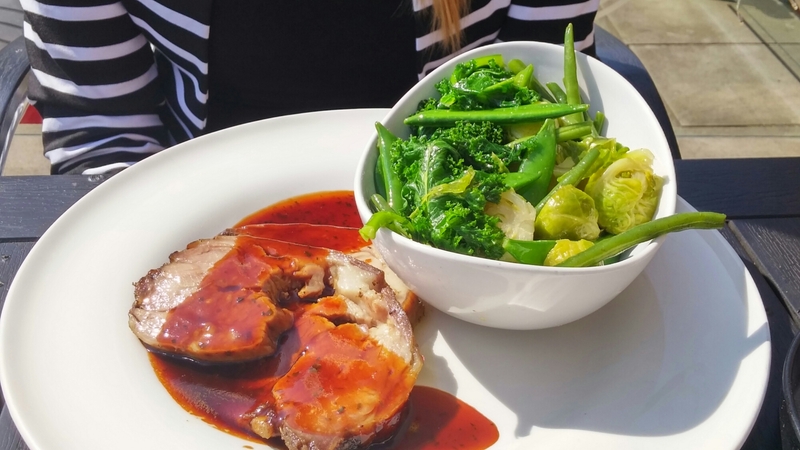 What J got was a lovely dish of meltingly tender, well flavoured lamb with a good gravy and a massive dish of nicely cooked al dente vegetable, including some squeaky french beans and nicely cooked sprouts. The kitchen here clearly knows how to cook both meat and veg. properly. All in all the food was very good in both mine and J”s opinion. 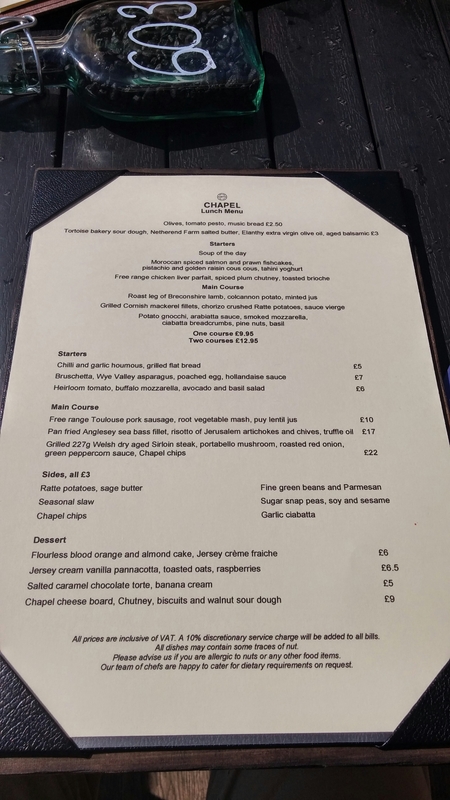 Whilst it was no booze for me as a mid-week lunch, I did have a look (prior to going) at the wine list, based on the evening menu looking like it warranted a go. They have a long list ranging from £18 for some pretty nondescript Chilean white and red wines (250% mark ups) to a frankly shockingly priced Chateau Cheval – Blanc 1er Grand Cru Classe St Emilion 2001 at £900! As regular reader of the blog will know excessive wine mark ups are one of my biggest bugbears and there are some seriously high mark ups being applied here. I can get the Cheval retail (should I so wish – and I don’t ) from Lay & Wheeler for £290.10 (duty paid I believe). That means the margin here is a shocking in excess of £600 over the retail price on one bottle!!!! 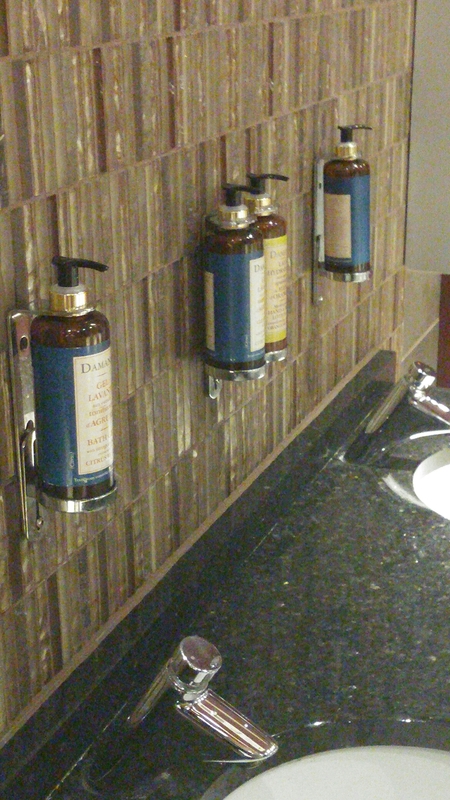 Out of curiosity I emailed them to ask if they allowed wine to be brought in and if so what the corkage charge was. The answer was “yes they do and it is £18 per bottle”. Quite steep when viewed in isolation, but it means bringing you own Cheval (if you have one), rather than buying from the list, would save you over £580! At a slightly lower level, the list has on it a bottle of Bodegas Lan Reserva ( a good, if not mind blowing, Rioja) for £39. This wine (not sure of the year here) usually retails at around the £14.00 (2007 vintage) mark (so that is close to a 300% mark up). With the corkage charge you are looking at £32, saving yourself a not inconsiderable £7, if you buy and bring your own. In their defence they are not alone in this, as virtually all UK restaurant apply very high mark ups on wine, but if a Michelin star restaurant in Spain (for example) can survive on mark ups of well below 100% (often 30%- 40% only) on wine why can’t UK ones (especially when you are looking at high end stuff). 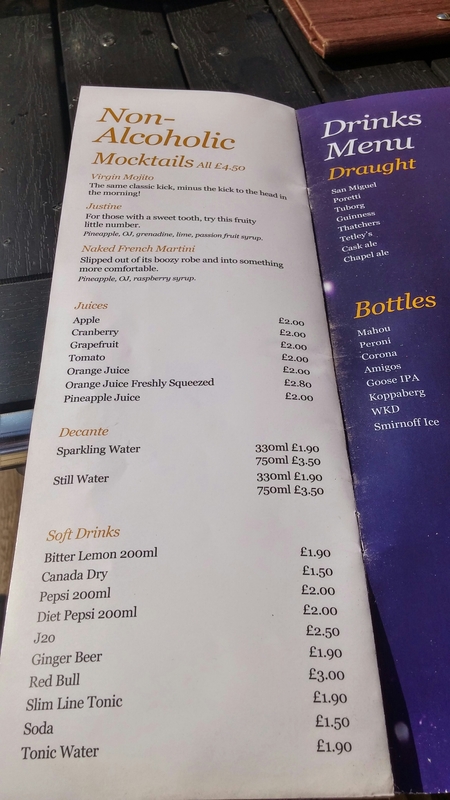 Whine about the wine over, on the soft drinks front they have a reasonable selection of sodas and juices plus a few mocktails. The damage for the two of us was around the £26 mark (with soft drinks, but no including tip). I though for what we got that was not bad. 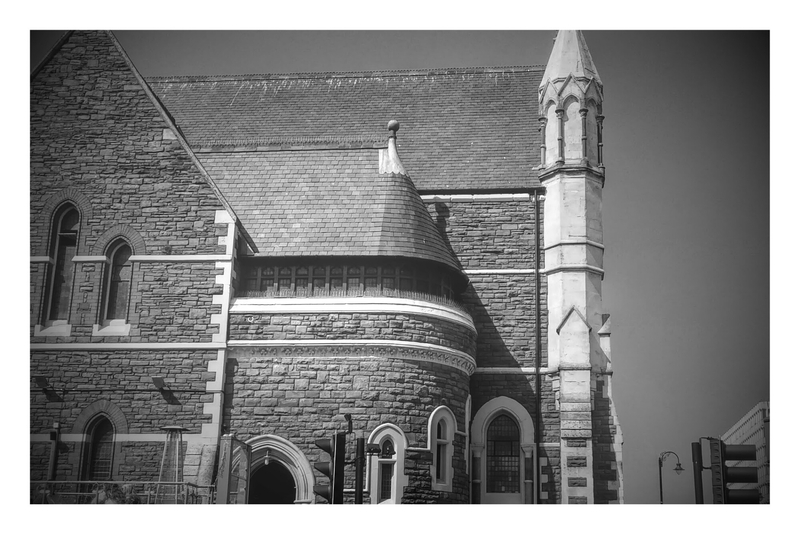 Lovely place and good food make for a strong offering by the Chapel 1877. J and I didn’t want to leave to go back to work, both of us thinking ruefully that we could have quite happily spent the rest of afternoon on their terrace. 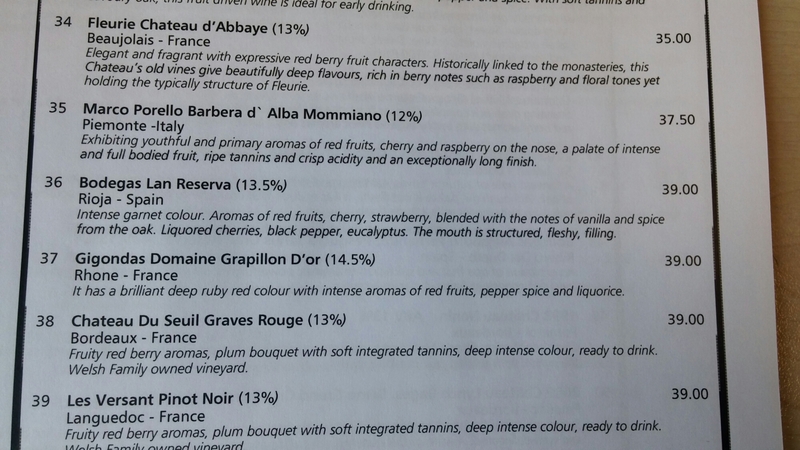 My only gripe was with the wine prices. A decent list is marred by some very hefty (unduly so in my view) mark ups. How is it ever justified to price at 300% plus over retail prices (especially at the top end of the list where this translates into a massive cash mark up amount. Would I go back? Oh yes, if the lamb dish J had was anything to go by Sunday lunch at the Chapel 1877 would be very good and the evening menu also looks very enticing. The bar menu is also great for lunch or to mop up booze in the evening. If, however, I was intending to drink wine I would seriously consider bringing my own and paying the corkage. I know it is weird paying to drink your own wine, but it is better than paying much more (even taking into account the base cost of the wine and the corkage charge) for the privilege of drinking someone else’s. If you are looking to BYO wine I would strongly suggest you tell them upfront at the time of booking (checking they still do it and confirming the corkage charge in the process) to avoid embarrassment. So in summary, praise worthy food but somewhat “sinful” wine prices. 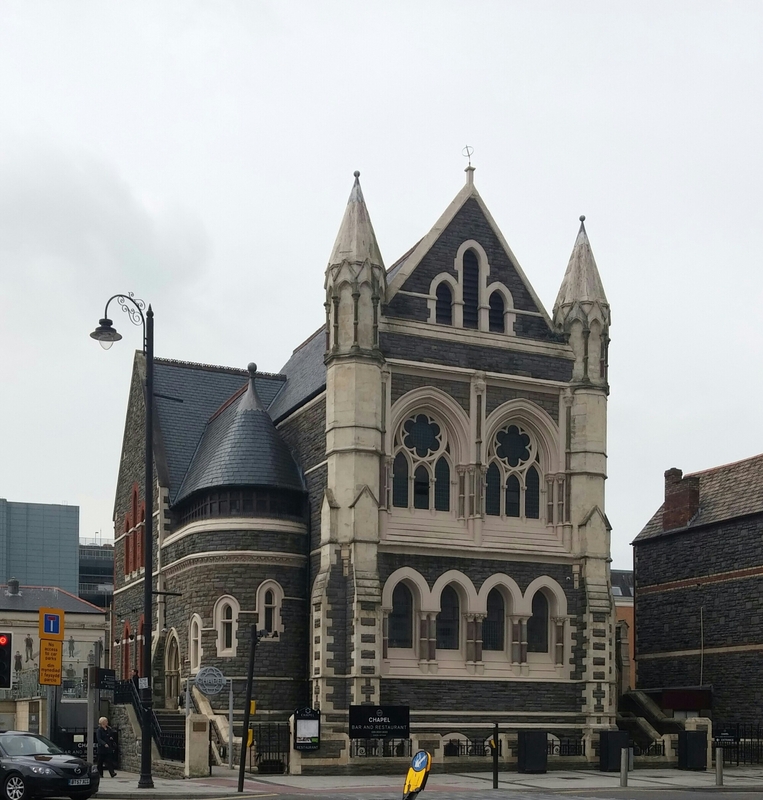 I had dinner here a couple of years ago and it was very good, but quite seriously priced for Cardiff. Lovely inside, upstairs. 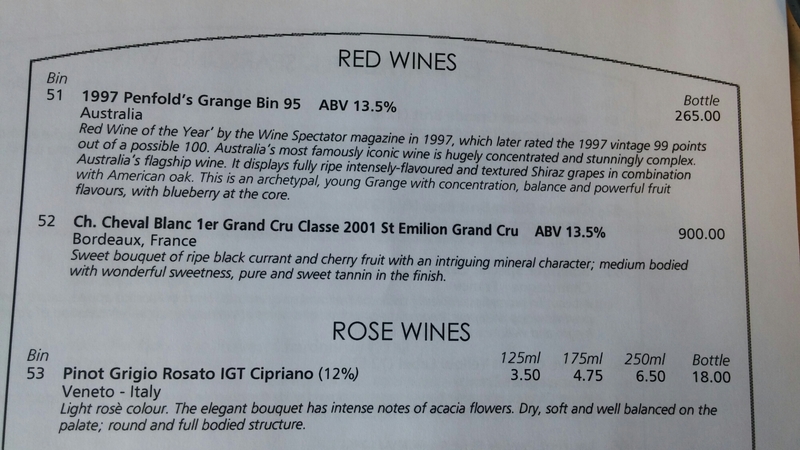 That Penfolds Grange 97 is about £100 cheaper than you could buy it from Berry’s. Agree with you though about silly mark ups. It just puts you off splurging on something special. Spanish high end restaurant mark-ups do seem exceptionally kind compared to the rest of the world. Yes Spain is fab for wine mark ups – usually 25% -40%. Interestingly was in Hawksmoor the other day and mark up on 1990 Chateau Montrose was a very reasonanble 25% (albeit over very high base retail price).. Lower down the list was a different story mind. 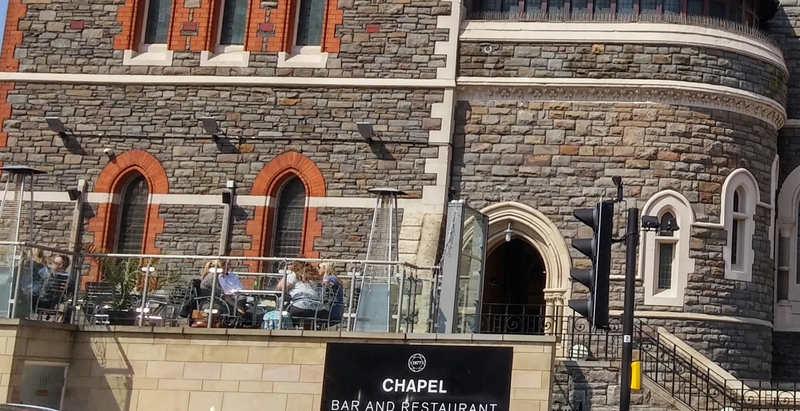 This entry was posted on May 3, 2015 by solicitingflavours in Alcoholic drink, American food, BYO, Cardiff, Chapel 1877, corkage, Drink, Fixed Price Menu, Food, Food and wine products, lunch, lunchtime, Non alcoholic drink, poutine, Restaurant Review, Sandwich, Wales, wine, wine mark up.